Tear the Chappathis to smaller pieces. Bake it in 250' for 15 mins or so till the pieces turn slight brown and crisp. Keep a check else it may burn dark. Use a blender/mixie, give a run till the pieces are powdered. Powder the jaggery, mix it with powdered chappathi. Heat the ghee/butter fry the nuts, and pour it over the powder. 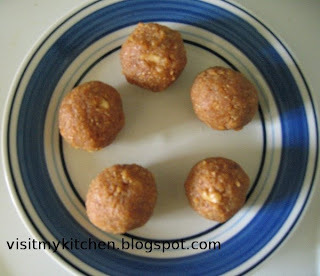 Add milk little by little just enough for them to bind well and make ladoos. glad that you tried it..tastes so good....isn't it?